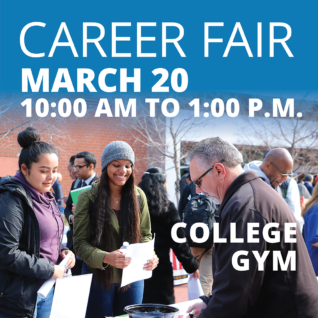 Learn all about local employment and training opportunities, get career counseling, have your résumé reviewed and more at CCC’s annual Career Fair! Most employers require online applications, but remember to bring copies of your résumé to personally share with recruiters and employers hiring at the event. Also, be sure to dress professionally to impress employers and set yourself apart. Participants who register on Eventbrite and check in at the event will be entered for a drawing for one of 10 $50 gift cards. El Cerrito Del Norte BART Station: AC Transit buses 72 and 72R are the most direct to the campus. Richmond BART Station: AC Transit buses 71, 74 and 76 are the most direct to the campus. The event facility is ADA compliant. Anyone requiring special assistance may call 510.215 .3209 prior to the event. Call 510.215.3209 for more information.